There might just be a turn in the weather! 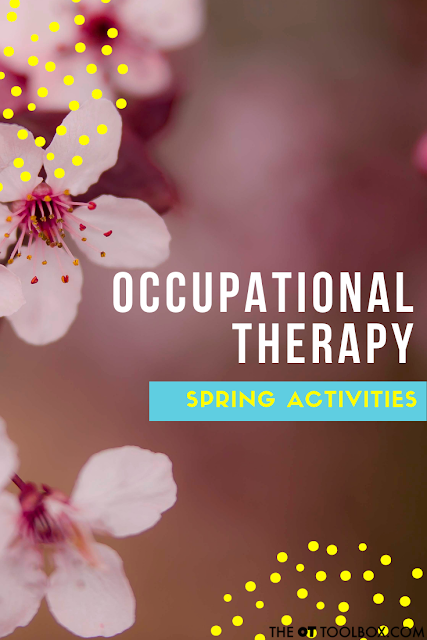 With a new season comes a new set of occupational therapy activities for the school-based occupational therapist or the OT working in early intervention or an outpatient clinic. 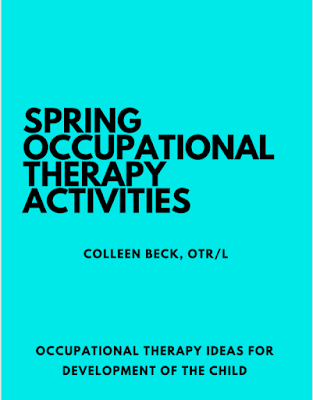 I'm excited to share an update to our Spring Occupational Therapy packet that now has a TON of therapy tools and Spring activities to develop various skills like fine motor, gross motor, visual perceptual, handwriting, sensory tolerance and play, and more. Looking for fun ways to add a creative spin to therapy sessions this time of year? You're in luck! 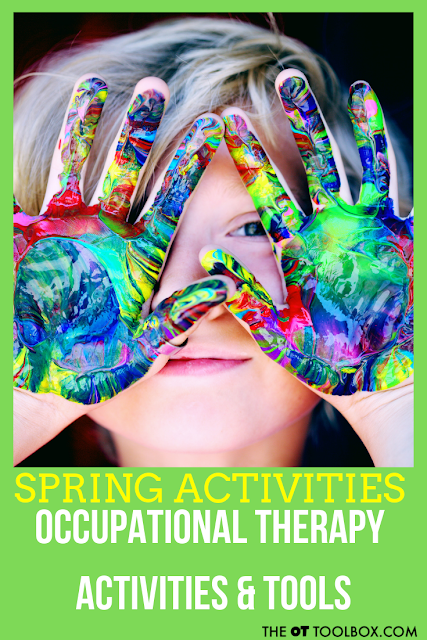 This week on The OT Toolbox, you'll find loads of Spring activities. Each day, we're rounding up activities, ideas, strategies, and tips that all have a Spring theme in common. Use these activities in your therapy plans to meet the specific needs of kiddos. So, be sure to stop back each day this week to load up on creative ways to promote healthy development of kids! 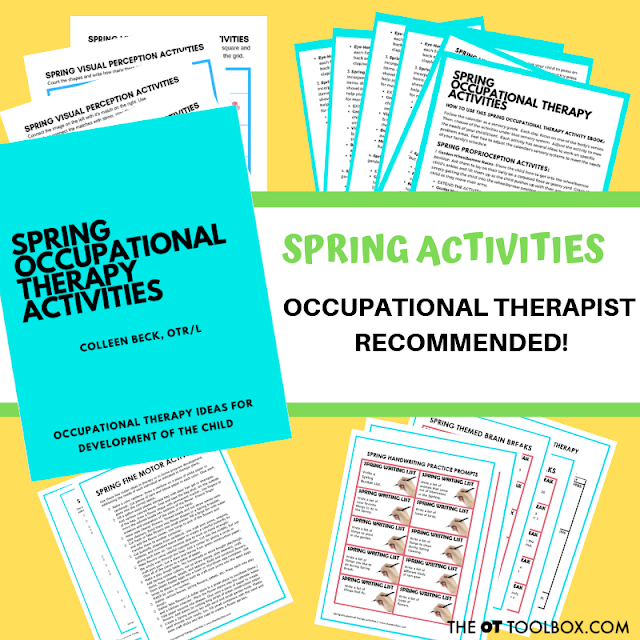 This time of year, one of our more popular products here on The OT Toolbox is our Spring Occupational Therapy packet. The best news is that, this packet has had a major upgrade from it's previous collection of spring sensory activities. All of the Spring activities include ideas to promote the various areas of sensory processing with a Spring-theme. There are ways to upgrade and downgrade the activities and each activities includes strategies to incorporate eye-hand coordination, bilateral coordination, body scheme, oculomotor control, visual perception, fine and gross motor skills, and more. Use these activities as warm-ups to your therapy sessions, or add them to the homework page below to create a home program. These two sheets are perfect for the therapist looking to incorporate carryover of skills. Use the homework page to provide specific OT recommended activities to be completed at home. This is great for those sills that parents strive to see success in but need more practice time for achieving certain skill levels. The Client-Centered Worksheet is a great way to incorporate the client's specific interests and goals so that overarching goal areas and functional goals incorporate interests and personal strengths, achieving that "just right" level of skill. 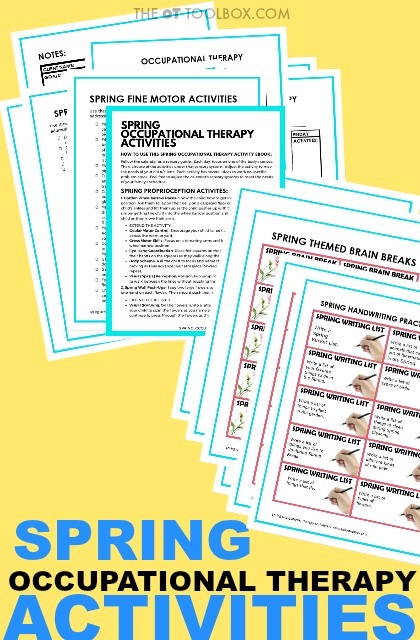 CLICK HERE to grab the Spring Occupational Therapy Activity Packet for just $7.99. Finally, included in the Packet are several sheets of visual perception activities. These are worksheets that can be used in so many ways! Laminate them or slide them into a page protector and use them over and over again with a variety of tools such as play dough balls (work those fine motor skills! ), pain dabbers, craft pom poms, wikki stix, or dry erase markers. These sheets can be printed off once and used over and over again with the whole caseload, using them in different ways. I'm so excited to get this updated packet out to you. If you're looking for ways to make therapy planning easy for the next few months, grab your copy here. This activity packet is 26 pages long and has everything you need to work on the skills kids are struggling with...with a Spring theme! Here's the link again to grab that packet. Grab your Spring Activities Packet HERE.